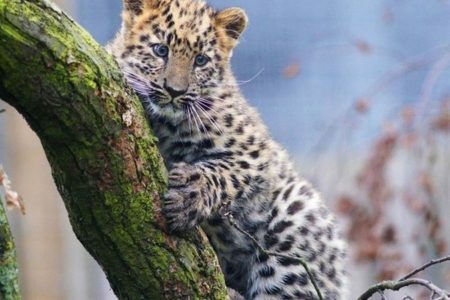 Yorkshire Wildlife Park’s pair of rare Amur Leopard cubs have taken their first tiny steps in public today, marking a great leap for their critically endangered species. The Leopards were born in June as part of Yorkshire Wildlife Park’s crucial international conservation project. “There has been a huge international effort to secure the future of this species and the two cubs are part of an exciting programme working towards re-introducing them to the wild,” said Simon Marsh, Animal Collection Manager at the park, in Branton near Doncaster. The young male leopards have just had all their vaccinations and are strong enough to appear in public. Amur Leopard numbers dwindled because of disappearing habitat and poaching but conditions have stabilised and the Amur Tiger and Leopard Alliance (ALTA) recently announced plans for a re-introduction in the Lazovsky Nature Reserve in Southern Sikhote Alin, an area where leopards disappeared approximately 30 years ago. Improved conservation efforts in Russia and China combined with an increase in the leopards’ traditional prey of sika deer has provided confidence that a new population numbers could rise over the next 15 years. The YWP Amur Leopard reserve, Leopard Heights, won the BIAZA award for Significant Advances in Animal Husbandry and Welfare in 2013. The innovative three reserve layout was specifically designed as a breeding centre for these critically endangered cats, with the nursery area out of sight from visitors to give the young cubs and their mother peace and quiet for the first few months of their lives. The cubs are now feisty and starting to explore their reserve and are ready to move into the next area which has a smaller version of the climbing frame that is a feature of the main reserve where their father Drake can be seen. Visitors to YWP have played a crucial part in the programme as the Amur Leopard and Tiger Alliance is one of the charities supported by the Yorkshire Wildlife Park Foundation. Find out more about Yorkshire Wildlife Park here.